The earliest account of phosphenes is that of the Bohemian physiologist Johannes Purkinje in 1819. He was the first to publish a detailed account of phosphenes (Oster 1970:85). In 1845, a Frenchman named Jacques Moreau used hashish to induce an hallucinatory condition, but was still able to report his experiences. However, such methods were not approved of by his colleagues (Siegal 1977:132). Eight years later, in 1853, his fellow countryman Brierre de Boismont stated that hallucinations were all characterised by excitation and the production of images from memory and their imagination whilst in states of insanity, delirium tremens, drug intoxication, nervous disorders, nightmares, dreams, ecstasies and fevers (Siegal 1977:132). In 1926, at the University of Chicago, Heinrich Klüver began a series of investigations. These were not dissimilar to those methods employed by Moreau eighty years earlier. Hashish had been replaced by mescaline, an hallucinogenic alkaloid derived from the peyote cactus Lophophora williamsii, and remarkable for the visual hallucinations it produced (Siegal 1977:132). In 1928, a German neurosurgeon, Otfrid Foerster, noticed that when he electrically stimulated the surface of the occipital lobe at the back of the brain, the patient experienced the sensation of light (Oster 1970:86). However, it was Max Knoll and his colleagues at the Technische Hochschule in Munich, who carried out the most extensive investigation of electrically induced phosphenes (Oster 1970:85). More recent research has been built upon the work produced by these men, and references to their work can be found in the majority of publications on the subject. "The eye is a sense organ that can be readily turned off" (Oster 1970:83). To exclude any optical inputs one must enter a totally dark room or wear a light-tight blindfold. However, once this is carried out, visual perception does not end; there is not an impression of total blackness. Once the eye has become adapted to the darkness, and particularly if one relaxes, the visual field lights up: wispy clouds and moving specks of light appear, generally in pastel shades of blue, green, orange and yellow. If one presses the eyes further, figures are evoked. These subjective images resulting from the self-illumination, as it were, of the visual sense are called phosphenes (from the Greek phos, light, and phainein, to show). Oster (1970:83) continues by stating that, because phosphenes originate within the eye and the brain, they are a perceptual phenomenon common to all mankind (past and present, one assumes), and they are extremely interesting from a psychological and aesthetic standpoint. Because their patterns must be intimately related to the geometry of the eye, the visual cortex, they provide a means of studying the exquisite functional organisation of the brain (Oster 1970:83). The occurrence of phosphenes can be spontaneous, and they can be provoked in a number of ways. They appear spontaneously only when visual stimuli are lacking and especially when the viewer is subjected to prolonged visual deprivation. According to Oster (1970:83), phosphenes may account for the 'illuminations', the visions or the experience of 'seeing the light' reported by religious mystics meditating in the dark; they are the 'prisoner's cinema' experienced by people in dark dungeons; they may well occasion reports of phantoms and ghosts. Darkness is not a requirement; only the absence of external visual stimuli is needed. Phosphenes are a hazard to the long-haul truck driver peering for hours into a snowstorm. Aeroplane pilots often experience phosphenes, especially when they are flying alone at high altitudes, where the sky is cloudless and empty of the usual depth cues (Oster 1970:83). It is instructive for an adult to ask an articulate child what is seen when they close their eyes at bedtime. Children have an ability, which diminishes with adolescence, to evoke phosphenes quite easily. Phosphenes may indeed be an important part of the child's real environment, since he/she may not readily distinguish this internal phenomenon from those of the external world (Oster 1970:83). The developmental significance of phosphenes is suggested by a study, conducted by Rhoda Kellogg at the Golden Gate Nursery School in San Francisco, of some 300,000 scribblings made by young children of different ethnic origins. Children between the ages of two and four, capable of manipulating a pencil but not of making naturalistic pictures, draw figures that have a distinct phosphene character (Kellogg R. 1965:1129-1130). Oster (1970:83) points out that this type of study may be of some interest to art historians, they might consider the possible effects of phosphenes as an 'intrinsic' source of inspiration for people of many different societies when they are speculating on relations and cross influences among primitive cultures. To date it seems that archaeologists, anthropologists and art historians have merely touched on this or used it in only a small and specific area of study, not utilising its universal potential (Oster 1970:83). According to Oster (1970:83) 'Seeing Stars' is seeing phosphenes, an experience that can be induced by a blow on the head or by other mechanical means. A less violent procedure is to apply pressure to the eyeballs with the fingers. If, with the eyes closed, one gently touches the lid with the tip of a finger, a phosphene appears: a glowing circle or part of a circle, apparently about a quarter of an inch in diameter. The phosphene's location in the visual field is opposite the point the finger touches: at the outer edge of the field when the eyelid is touched near the nose, low in the field when the centre of the upper lid is touched. This is discussed in more detail by Walker (1981:142) when he describes all the methods by which phosphenes can be generated by pressure alone. Increasing the pressure on the eyeball produces more dramatic phosphenes. One procedure is to apply the index fingers at the inner edge of the eyeballs and press in and toward the temples. The visual field lights up and then, as pressure is maintained for a few seconds, a scintillating design appears - a kind of checkerboard or shifting field of glowing dots, sometimes with elaborate substructures arrayed around a luminous centre. When the pressure is released, the checkerboard fades away, sometimes leaving the central luminosity. If the pressure is then renewed, a pattern of bright, irregular lines appears that resembles a system of blood vessels. When the pressure is again released, a fine filigree image appears and remains for some time. The checkerboard design is probably some manifestation of the orderliness of the neural network of the retina; it shifts in the visual field as the gaze is shifted. The filigree, on the other hand, may be generated farther along the visual pathway, since it remains stationary regardless of where one looks. However, there is a degree of individual sensitivity; some people can make phosphenes occur regularly with little provocation and after-images which last a long time, others cannot (Oster 1970:83-4; Brindley 1963). One way of producing phosphenes for experimental purposes is to induce them electrically. In an early account, Johannes Purkinje "applied one electrode to his forehead and the other to his mouth, and by rapidly making and breaking the current with a string of metal beads he was able to induce stabilised phosphene images" (Oster 1970:85). However, it was Max Knoll and his colleagues at the Technische Hochschule in Munich who carried out the most extensive investigation of electrically induced phosphenes. "He found that pulses in the same frequency range as brain waves (from 5 cycles per second to about 40) were most effective in producing phosphenes. He tested more than 1000 people and found that all of them, after becoming dark-adapted, saw at least a flickering light; by concentrating carefully about half of the subjects also a saw geometric figures" (Oster 1970:85). Figure 1 illustrates 15 of the images outlined by Knoll (after Oster 1970:87). "As Knoll varied the frequency of the pulses the patterns changed, and by altering the frequency Knoll's group identified 15 classes of figures and a number of variations within each class. For each person tested the spectrum of phosphenes (the kind of pattern at each frequency) was repeatable, even after six months" (Oster 1970:85). The Munich group also found that electrically induced phosphenes were considerably more elaborate for subjects who had been given a very small dose of a hallucinogenic drug, say 10 micrograms of LSD (Oster 1970:85). As Oster (1970:86) mentions, phosphenes seem to originate at different points along the visual pathway (the basis of a method employed in the study of blindness to locate the actual region of the visual system which is damaged). The visual areas of the brain can be stimulated directly to produce phosphenes. This has been demonstrated by a number of investigators, usually in the course of brain operations during which the patient is conscious under local anaesthesia. "The technique of electrical stimulation of the surface of the brain (the cerebral cortex) has been highly developed in recent years by Wilder Penfield and his colleagues at the Montreal Neurological Institute. They apply an alternating current to two closely spaced electrodes in contact with various areas on the surface of the brain. Stimulating the visual cortex at the extreme rear of the brain interrupts the patient's normal vision and causes him to see specks of light. When electrodes are moved to the adjacent region, the visual associative area, the patient reports seeing phosphenes of geometric design. When the electrodes are moved father forward, the patient frequently reports a visual scene of some past experience that is so vivid as to be current (Oster 1970:86). "One reason for pursuing research into such methods is the possibility of developing a visual prosthesis for people blinded by injury to the eyes or the optic nerve. The cortex of such a patient may be subject to electrical stimulation even though they may not have received visual inputs for several years" (Oster 1970:86). As entoptic means 'within vision', and phosphene means 'to show light', one instantly thinks of blindness. How is someone who is blind affected by phosphenes, if at all? The lack of external stimuli should not pose a problem. Oster highlights this area to minimal extent. He quotes the work of Brindley and Lewin, whose initial studies employed baboons in tests. They used resonators, which had been coated in silicone plastic and placed under the scalp, and corresponding platinum electrodes, which were in contact with the visual cortex. They later used this technique on a woman who had been blinded in both eyes by glaucoma. She reported seeing different phosphenes depending on which resonators were activated. However, as Oster (1970:87) points out, "the resonator-implant method may never be effective for someone who has been blind since birth. Such people do not report phosphenes, whereas many persons blinded by accident or disease are conscious of phosphenes and indeed find them a source of visual entertainment" (Oster 1970:87). The question remains, why do people who have been blind since birth not experience phosphenes? Is it due in part to their possible inability to describe them in accurate detail, or are they truly in darkness, and if so why? The above studies have primarily concerned the production of phosphenes under non-drug related conditions. Here we concentrate on the work of Siegal (1977) and his studies of hallucinations. A broad distinction can be drawn between two areas of research. Non-drug-induced states which produce phosphenes and no more. Drug-induced states produce phosphenes and form constants whilst in a state of hallucination. They also move on to a second stage of more iconic and complex representations (Lewis-Williams and Dowson 1988:203). "Phosphenes are also induced by a wide variety of chemical agents. Alcohol is one; a person with delirium tremens may see a field of bright, moving specks that he may interpret as insects crawling on the wall. Toxins such as those associated with scarlet fever may evoke similar phosphenes. Hallucinogenic drugs such as mescaline, psilocybin and LSD often evoke phosphenes of abstract design. Indeed, phosphenes appear to be a significant feature of psychedelic intoxication. Some years ago I took a small dose of LSD (75 micrograms) in the course of an experiment in visual psychology. Long after the other effects of the drug had worn off - for six months, as a matter of fact - I saw magnificent phosphenes at bedtime. For the most part they were variations of rather simple geometric forms in pastel shades of yellow, orange and green. (Psilocybin, according to other investigators, tends to produce phosphenes in disquieting colours - deep blue and dark green)" (Oster, 1970:84-5). "Pronounced phosphenes are associated with a number of disorders. A person suffering from migraine headache may see a checkerboard or 'fortification' pattern, usually in the half of the visual field that is opposite the side of the head where the ache is localised. Ophthalmologists recognise a pronounced phosphene that regularly accompanies movement of the eye as a symptom of a detached retina. Disturbing phosphenes may also arise from pressure on the optic nerve or on the visual regions of the brain, caused by a tumour or by some vascular disorder within the cranium" (Oster, 1970:85). It is not only the human element which is susceptible to hallucinations, but the whole mammalian population (Siegal and Jarvik 1975:81-104). 'Non real' visual percepts would have been experienced long before the Upper Palaeolithic. It has been widely accepted that the human nervous system is universal and that it is much the same now as it was in the Upper Palaeolithic. Hallucinations are thought to be culturally biased in their generation. It must follow that any description or depiction of an hallucination will also be culturally biased. This being the case, the emphasis has been transferred to the imagery which is generated in the nervous system. These phosphenes and form constants are thought to be culturally unbiased during their generation. However, culturally unbiased during altered states of consciousness they may be, but, as with hallucinations, any explanation or depictions of them become culturally biased. The viewer makes a conscious decision concerning which images he/she pays attention to: he/she uses subjective terminology in the description of his/her visions, and cannot avoid the innate need to use similes. Because these form constants and phosphenes are derived from the human nervous system, "all people who entertain altered states of consciousness, no matter what their cultural background, are liable to perceive them" (Eichmeier and Höfer 1974; Reichel-Dolmatoff 1978). Phosphenes can be induced by physical stimulation such as pressure on the eyeball, and are thus entophthalmic ('within the eye'). Form constants derive from the optic system probably beyond the eye. Form constants and entoptic phenomena are largely geometric forms and phosphenes or entoptics	are non-culturally biased. Hallucinations are more complex, culturally controlled iconic visions. As Siegal (1977:132) states, to perceive things which are not actually there is termed an hallucination. The term 'hallucination' comes from the Latin 'hallucinari', meaning 'to dream or to wander in mind'. However, Siegal (1977:132) believes this to be far from precise; he would prefer to use the definition which is widely accepted in psychiatry: "A false sensory perception in the absence of an actual external stimulus. May be induced by emotional and other factors such as drugs, alcohol and stress. May occur in any of the senses" . In this case the sense we are concerned with is primarily the visual. Taking this broad based definition into account, at some time or other the majority of people will have availed themselves of drugs or alcohol, or experienced stress. It is also likely that everyone has at one time or other experienced an hallucination. Siegal (1977:132) points out that lonely explorers, isolated hunters in the Arctic and prisoners in dark cells have reported experiencing them. Siegal set out to answer the question, "Do the hallucinations of one person have anything in common with those of another?" With the aid of his colleagues at the Neuropsychiatric Institute of the University of California at Los Angeles, he attempted to answer this very question with the aid of experiment. On the whole, they found that hallucinations did have a great deal in common, and that "the experiments point to underlying mechanisms in the central nervous system as the source of a universal phenomenology of hallucinations" (Siegal 1977:132). By the very nature of Klüver's (1926) descriptions the problem of definition springs to mind. The terminology is subjective; the definition of what one imagines to be filigree may vary from person to person. He further characterised these constant forms by "varied and saturated colours, intense brightness and symmetrical configurations" . Klüver (1926:503) goes on to say that the visions appeared to be located at reading distance, and that they varied greatly in their apparent size, and could not generally be consciously controlled. Siegal notes that the majority of drugs which give rise to these images are termed hallucinogens, but goes on to say that other drugs and substances can produce similar effects. He therefore states that most psychoactive compounds (to the extent that they cause the mind or attention to wander) can also be regarded as hallucinogens. These may include: alcohol, carbon dioxide, cocaine, cortisol, digitalis, scopolamine and even tobacco with a high nicotine content (Siegal 1977:132). During Klüver's (1926) studies of hallucinations, he noted that little was reported by the subjects on the simple geometric designs of the hallucinations or on the detailed descriptions of more complex images. Instead they tended to concentrate on the iconic representations, among those described being religious symbols and images, images of small animals and human beings, many of which were in the form of cartoons or caricatures. Klüver puts these omissions down to the novelty of the hallucinatory experience, stating that the subjects may have been overwhelmed by the colour and brightness of the images. Another explanation could be that the subjects passed off the simple geometric imagery as being less important than the complex icons (Siegal 1977:132). Siegal and his colleagues set about their research in the hopes that it might highlight the existence of a common visual imagery underlying hallucinations which might, in turn, lead to a better understanding of the origin of these and related percepts. The aim of Siegal's initial experiments was to see if this hallucinatory phenomenon appears in untrained subjects who had been given hallucinatory drugs. Siegal established two groups: the first were given a placebo and the second group were given a drug (either marijuana or tetrahydrocannabinol), neither group knowing which had had which. All subjects were asked to lie on a bed in a light-proof and sound-proof room, whence they recounted their experiences. The first (placebo) group reported seeing imagery characterised by amorphous black and white forms moving randomly in the visual field. This basic imagery can be experienced by anyone who closes his/her eyes whilst in a dark room; gently rubbing one's eyes might produce slightly coloured and geometric imagery (Siegal 1977:134). The second (drug-induced) group showed different results. The number of reported images showed a marked increase. A number of subjects showed a difficulty in describing the images they saw, but they agreed that there were many geometric forms in them. Their images were characterised by a bright light in the centre of the field of vision that obscured the details but allowed images on the periphery to be observed. The location of this point of light created a tunnel-like perspective. The range and intensity of colour increased along with the increase in the quantity of the drug. Geometric forms frequently combined, duplicated and superimposed. Siegal reports that at times the subjects had difficulty reporting what they saw as it appeared. This was due to the rapid nature of the imagery. The second group progressed to a further stage; here they reported that the geometric forms had been replaced by more complex imagery. These included recognisable scenes, people and objects, many in cartoon and caricature form (as was the case in Klüver's studies) and they showed some degree of depth and symmetry. Also, these complex images were often projected or superimposed onto a background of geometric forms (Siegal 1977:134). MOVEMENT PATTERNS aimless, vertical, horizontal, oblique, explosive, concentric, rotational and pulsating (Siegal 1977:135). To make sure that the subjects had a sound understanding of what was meant by each descriptive term, Siegal showed them hundreds of different slides illustrating each term. Therefore if a subject came across an image which did not exactly fit one of the slides he/she would be able to classify them appropriately on the basis of common features. These images were also shown to the subjects for a minimal time (8 milliseconds to be precise): this was to accustom them to the rapid nature of the hallucinations themselves (Siegal 1977:135). This newly-devised procedure was carried out on a weekly basis on the chosen subjects. Some of the subjects were trained, some not, in order to determine if there was a difference in the reports. The subjects were given either an hallucinogen, a stimulant, a depressant or a placebo, varying in doses (Siegal 1977:136). The results were as follows: the trained subjects could keep abreast of the rapid flow of imagery and could readily classify most of the images into the categories of the reporting code. On average, the trained subjects managed 20 reports per minute, whereas the untrained subjects only managed an average of 5. The results also varied with the drugs taken. 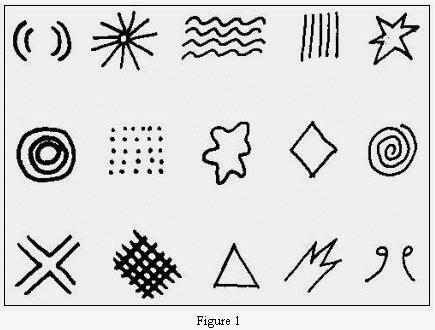 Siegal (1977:136) reported that the subjects who took the placebos, the stimulant d-amphetamine and the depressant phenobarbital, described the imagery as black and white random forms moving about aimlessly. Those who took the hallucinogens tetrahydrocannabinol, psilocybin, LSD and mescaline experienced dramatic changes. "The forms became less random and more organised and geometric as the experience progressed. The black and white images began to take on blue hues, and movement became more organised and pulsating" (Siegal 1977:136). there was usually no complex imagery reported until after the lattice-tunnels stage (Siegal 1977:136). The remarkable consistencies between the images reported by the subjects led Siegal to wonder how universal these effects were. He notes that some of them are strikingly similar to the primordial or archetypal forms (such as the mandala, the mystic symbol of the universe employed in Hinduism and Buddhism as an aid to meditation) that the psychoanalyst C.G. Jung described as part of man's collective unconscious. He also notes that anthropologists have stated that the hallucinogen-inspired art of may primitive peoples often contains constants in form, colour and movement (Siegal 1977:138). Siegal and his colleagues chose to study the peyote-taking Huichol Indians of the Sierra Madre of Mexico. The images recounted by the Indians during the peyote ceremonies proved virtually identical to the symmetrical, repeating patterns found in Huichol weaving and art (Siegal 1977:138). This is just one example of phosphenes and form constants being reflected in the art of societies which ritually use drugs. It would not be too presumptuous to suggest that they are one of many, both past and present which I hope my study will confirm. "(1) Adequate descriptive terms are hard to find. Most investigators emphasise the point that the phenomena defy all description. H. Ellis says, "The chief character of the visions is their indescribibleness" [H. Ellis, Mescal: a new artificial paradise, Annual Rep. Smiths. Inst., 1897, 537]. This is due partly to the fact that forms and colors show certain characteristics not experienced previously in such a way, and partly to the transitoriness of the phenomena. (2) The phenomena are frequently but not always localized at reading distance. Sometimes they are nearer or father away. Movements may occur in all directions, but movements of approach and recession do not occur so often. (3) The center of the visual field if often distinguished from the remainder of the field; there may be greater brightness, a different color or rotation while the remainder of the field is motionless (or vice versa). In the case of designs the center is often aesthetically the dominating part. Frequently, the field of vision is similar to the interior of a cone the vertex of which is lying in the center of the field directly before the eyes (or vice versa). (4) The visions cannot be influenced by 'thinking' and 'will'. (5) Visual memory-images and visionary phenomena exist independently. (6) All spectral colors can be observed. There is no indication that certain colors occur more frequently than others. Sometimes approximately complementary colors appear simultaneously or successively. (7) In the majority of cases the arrangement of objects in the optical field is symmetrical. (8) The observation of the phenomena is accompanied by pleasant feeling tones" (Klüver 1926:503-4). These were his main observations. For a complete account of his vision, which lasted several hours, one must see the original report (Klüver 1926:504-506). He also noted that even after the true vision ended, the visionary phenomena, dominated by arabesques, ornaments and various geometric patterns, lasted until he retired for the evening and could always be seen in the dark room with open eyes. Klüver ends his paper by making suggestions for further experimentation. He feels it would be beneficial to test the effects of mescalin on a congenitally blind person, and on a totally or partially colour-blind person, among others (Klüver 1926:513). One question we must ask is whether we can assume that the visual systems of our ancestors were similar to ours, and resulting in the interpretation of visual material, the fragmentation and absorption occurring in the same way. One must also consider whether, if the seeing of phosphenes is inherent to the human visual system, and the human visual system is similar in essence to the primates, would it follow that primates will also experience phosphenes. This is a difficult point for two reasons: what evidence is there for primate art and how easy is it for primates to replicate images seen in their mind's eye? As has already been reported, it is thought that humans are not the only ones to see phosphenes, but the whole mammalian population (Siegal and Jarvik 1975:81-104). Whiten (1976:20) notes the work of W.N. Kellogg and his wife (1933), who studied a young chimp called Gua, which lived with them. They first noticed that when "Gua's breath condensed on a window-pane, she would make marks in the misted area using either the nail or tip of her index finger" (Whiten 1976:20). The Kelloggs also noticed the similarities between these images and those made by their infant son. Such 'art' is also suggested by the evidence from the studies of chimpanzees. Morris (1962:20-31) reports three such case studies: (1) Schiller's (1951) study of a chimp called Alpha; (2) Morris' (1962) study of Congo; and (3) Kohts' (1935) study of the chimp Joni, as compared to that of Kohts' son Roody. In Schiller's study, Alpha was 18 years old and had produced over 200 drawings. Alpha had shown interest in drawing for a number of years, begging for any pencil and notebook she saw. If given them, she would return to a corner of her cage to scribble with great concentration. She tended to mark the corners of the paper, a feature which I have noticed in the drawings of my nephew between the ages of eighteen months and two years. With this ritual in mind, Schiller formulated tests with papers which had already been marked in the corners. Alpha was given one or two coloured pencils and pieces of paper which were withdrawn before they were destroyed (Whiten 1976:20). Alpha's early drawings were uncomplicated, but a gradual tendency towards rambling lines and zig-zags developed. Morris (1962) carried out similar tests on a chimp called Congo, and the results were compared. Both Alpha and Congo almost always kept their drawings within the boundaries of the frame. Congo's early work, like that of Alpha, showed a simplicity. This developed into the creation of a 'fan pattern', which occurred in fifteen of Congo's forty drawings, and in over seventy further cases of painting. On the basis of other behavioural evidence, Morris (1962) believed that this 'fan' production was not merely a mechanical process, but that Congo had developed some sort of 'fan image' in his mind (Whiten, 1976:22). For evidence of Palaeolithic 'fan' symbols, see Figures 23c and d.
A chimp called Joni was studied by Kohts (1935, no full reference available). The simple lines of Joni's early work gave rise to a more varied style, with long lines being crossed by shorter ones. On examination the early drawings of Roody, Kohts' son, and those of Joni, are impossible to distinguish. It is only later when they differ stylistically, and because of Roody's use of iconic imagery (Whiten 1976:21). An important point to note comes from the study of a chimp called Bella (Kortlandt 1959). If her keepers interrupted her drawing, they would be bitten. On no other occasion was the keeper bitten, even when taking attractive food away from her. This would indicate the importance of drawing to the chimp, and how intense an activity it was. The majority of the research cited here comes from the 1970's or earlier. I have been unable to uncover more recent material on the subject. Whether this is due to such research being meagre, or inadequacy of my enquiries is uncertain. This chapter aimed to summarise the history of such research from its beginnings in 1819 to the present day. The main researchers in the field of phosphene research have been quoted here. I also wished to give equal attention to both drug-induced and non-drug-induced phosphenes, as it is feasible that one or the other method, or indeed both, may have in fact been employed. The evidence strongly suggests that phosphenes and form constants (collectively known as entoptics), can be generated by several different methods, both intentional and non-intentional. Klüver outlined thirteen conditions (including drug-taking) under which entoptics could be generated. The evidence further suggests that the degree to which the entoptics present themselves is dependent on the method of generation employed. The most vivid images were undoubtedly generated by use of hallucinogenic drugs?. To summarise all the information which has been presented here would be difficult, as it is already in a highly condensed form. There remain unanswered questions, which may have great implications for future research in this area. First, why do people who are blind, but not since birth, experience phosphenes when people who have always been blind do not? Secondly, what conclusions can be drawn from the comparisons made between infant art and higher primate art? If it is true that the generation of phosphenes is not exclusive to humans, but can also occur in higher mammals (Siegal and Jarvik 1975:81-104), may this not suggest, coupled with the evidence put forward by Morris (1962) and Kellogg (1933), that the beginnings of artistic creativity in both apes and humans stem from a mutual source: the nervous system? However, it would be necessary to conduct more investigations into both primate and infant human art before drawing any firm conclusions. If one accepts the evidence which identifies hallucinogenic drugs as producing the most vivid imagery, our next task is to determine if the available data supports the theory that past populations would have had access to hallucinogenic substances and would have been aware of their effects through usage. It would be acceptable to suggest on the basis of the evidence that our antecedents had phosphenes available to them through one form of generation or another. It may even have been the case that, with a reduction in the harshness of modern visual stimuli and more peaceful surroundings, our antecedents may have indeed been better candidates for seeing such imagery than ourselves.